Paper Waste Water Control Through Sludge Dewatering Machine . How To Deal With Paper Waste Water. Because the liquid sludge has high fluidity, more free water and no pressure resistance, so get into the gravity Dewatering zone first to remove the free water, slowdown the fluidity of sludge, make floccules and interparticles produce strong binding force, and then get into wedge-shape re-pressure Dewatering stage, and the sludge almost lose the fluidity after gravity Dewatering, prepare for the cyclotron Dewatering and shear Dewatering. The sludge basically remove the water in the free water and floccules after gravity Dewatering and wedge hydration. The sludge get into cyclotron Dewatering, gradually improve the mesh belt tension through the diameter change of rotating stick, becoming the gradual Dewatering. When the mesh belt clip mud get into the roll which has smaller diameter, the filter drawing force produce the pressure and the pressure put the mesh belt clip mud into filter which up and down are symmetry, and the Dewatering treatment is performed by the shear force generated by the difference in the direction of rotation. HD Series Sludge Dewatering Machine mainly consist of frame body, roller body, Dewatering stick, Dewatering plate, active stick, revolving stick, tensioning stick, transmission device, air control device, electric control device, spray cleaning device, etc. The whole machine is sealed and operated, and it can be directly observed. The shell is easy to disassemble and install, no sewage is leaked, no secondary pollution, noise is 45 decibels, and the sludge machine room has beautiful environment and civilized production. 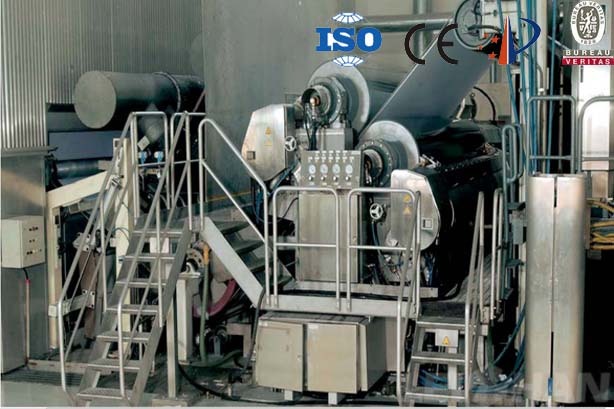 If your factory need the machine which can control waste water , you can contact with us.